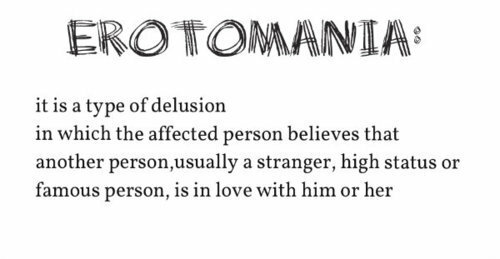 Erotomania or Clerambault’s Syndrome, is a mental state in which a person faces delusions that his or her crush actually have the same feeling towards him/her as he/she possess. Erotomania has also been knows as de Clerambault’s syndrome, named after the French psychiatrist who identified this particular psychiatric disorder. 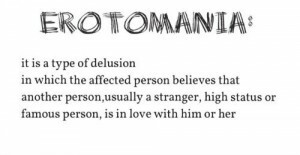 Another name used to refer to Erotomania is Fregoli Delusion. It was named after Italian actor Leopoldo Fregoli. One of the subsets of Erotomania is the place a man beguiles himself into suspecting that someone, more often to be of higher social standing and invariably famous, is in love with them. This conviction is so profound that when the object of their desire lets them know that they don’t have any such feelings, it is taken as the famous person’s desire to keep the relationship secret. In Erotomania person can be delusional for months and in majority of for cases even years. Since Erotomania is a psychiatric issue, it is extremely hard to diagnose it. Only highly qualified psychiatrists are able to diagnose the disorder. Delusions for not less than a month. Jealousy over specific thing related to patient’s crush. Too much fanny behavior towards a famous celeb. Catatonic behavior: Abnormality of movement and behavior arising from a disturbed mental state (typically schizophrenia). It may involve repetitive or purposeless over activity, or catalepsy, resistance to passive movement, and negativism. Patients of Erotomania have often saw changing their diet plan frequently so must look for that too. The person affected by Erotomania behaves normal. The delusion only affects the areas of life in which it is relevant. So as you can assume from the above, it is not very easy figuring out existence of Clerambault’s Syndrome. 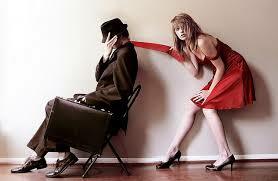 Well treatment of Erotomania includes medication in blend with psychotherapy. Antipsychotic drugs do well. But family company is required too. Patient needs company of friends, fellows and family to help his/her forget about the craze she/he possess for some one. Marriage is also good idea if Erotomania’s patient is young. But still special therapy focused on management of symptoms is required. Some psychiatrist helps patient to “quit” their obsession while others try to divert patient’s thinking to something else. John Hinckley Jr. is supposed to have attempted to assassinate President Ronald Regan because of an Erotomaniac delusion to Jodie Foster. Rebecca Schaeffer was murdered by Robert John Bardo, who supposedly suffered from Erotomania. David Letterman and former astronaut Story Musgrave were stalked by Margret Mary Ray, who was suspected to suffer from Erotomania. Concerned with a friend who may have this disorder. Symptoms are spot on! How can I help as a friend? if you are not a doctor, you can help him by bringing him to a competent physician for proper checkup.